With clever storage and a retractable skylight, a London apartment feels larger than its 576 square feet. 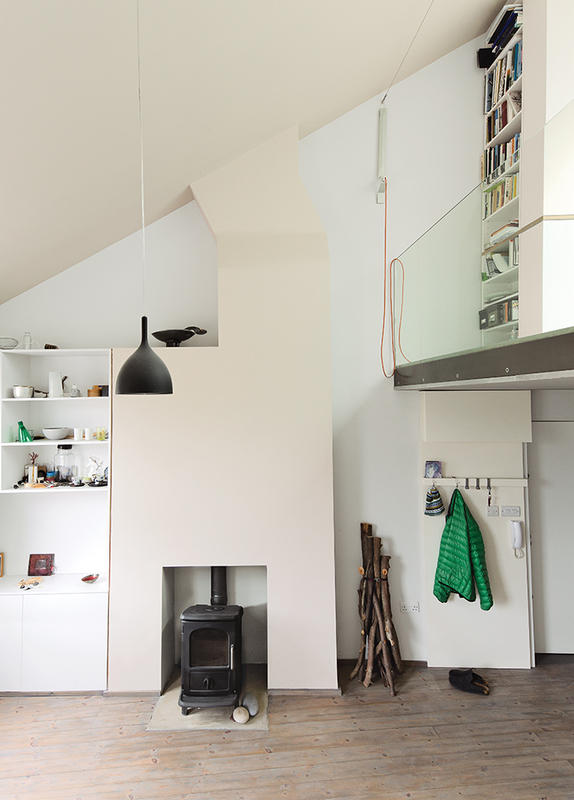 Architects Silvia Ullmayer and Allan Sylvester worked with joiner Roger Hynam to reinvent an apartment for metalworker Simone ten Hompel. 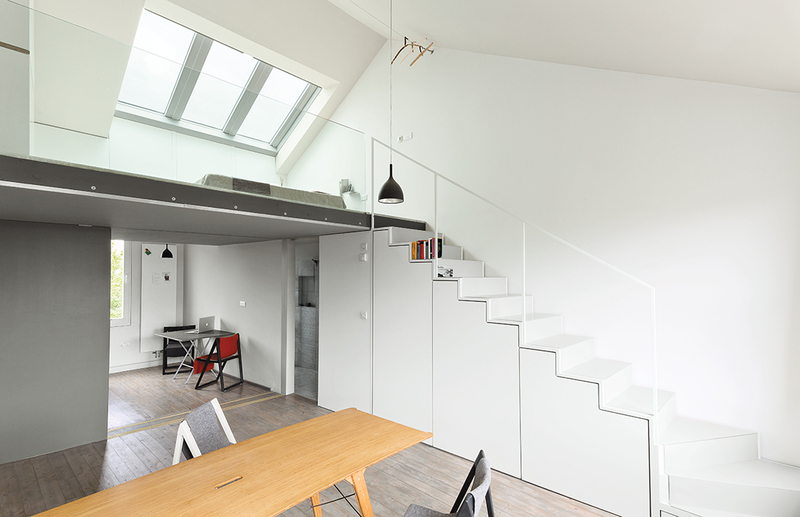 The stairs lead to a sleeping loft outfitted with a mechanical skylight. Hynam designed and built the cabinets under the stairs and a drawer that slides out from beneath the bottom step. Drink H1 pendant lamps from Rotaliana hang in the kitchen and above a Grassworks dining table by Jair Straschnow. 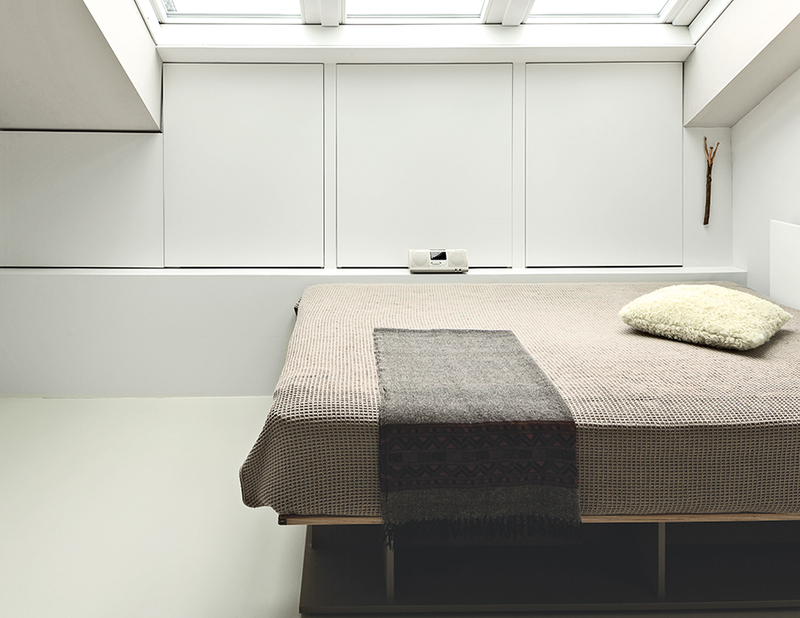 Hynam built additional storage along one angled wall of the bedroom loft and beneath the skylight. The bed, also by Hynam, is on casters, allowing ten Hompel to move it to gaze at the stars. 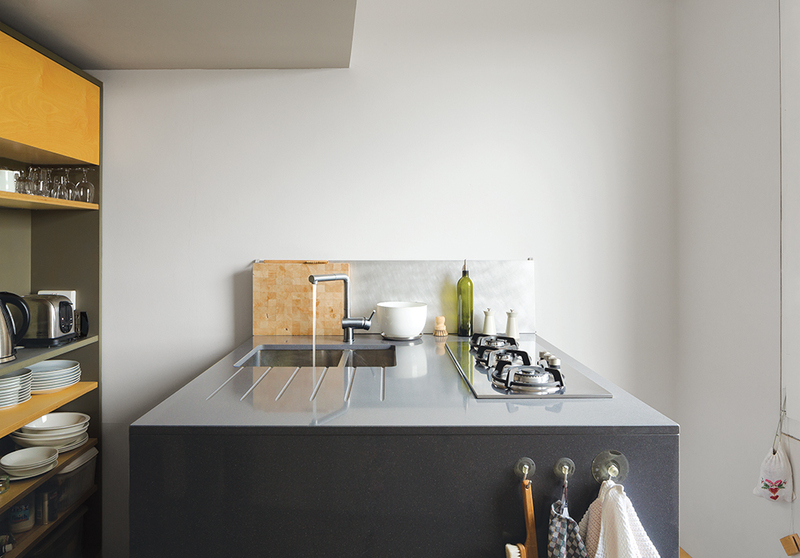 The kitchen features a compact cooktop by Whirlpool. The Salvatori marble tiles in the bathroom were added at the last minute, once everyone was confident that they would not put the project over budget. A sliding storage wall can be tucked aside to allow a seamless connection to the living and dining area. For 15 years, metalworker Simone ten Hompel lived uncomfortably with the shortcomings of her London flat—four poorly insulated rooms squeezed into 398 square feet. She used the cold bedroom at the back for storage and the small living room at the front for virtually everything else; a futon mattress on the ground served as her bed and sofa, and a tray doubled as a dining table. She finally reached the breaking point in 2008 and approached Roger Hynam of Rogeroger Design Solutions, who had trained as an architect before becoming a joiner. Hynam, who once kept a workshop in the same building as ten Hompel’s metalworking studio, told her that he would prefer to concentrate on carpentry for the renovation and suggested that she hire Silvia Ullmayer and Allan Sylvester of Ullmayer Sylvester Architects to design her new living space. To make the most of the small footprint, they opted to remove all the internal walls and knock through the ceiling. The latter move created a mezzanine bedroom, giving ten Hompel more than 178 square feet of additional floor space, and doubling the height of the living room to 16.4 feet at its tallest point. The new ceiling has a fully retractable mechanical skylight that opens 8.2 feet wide and closes automatically when sensors detect rain or excessive wind. 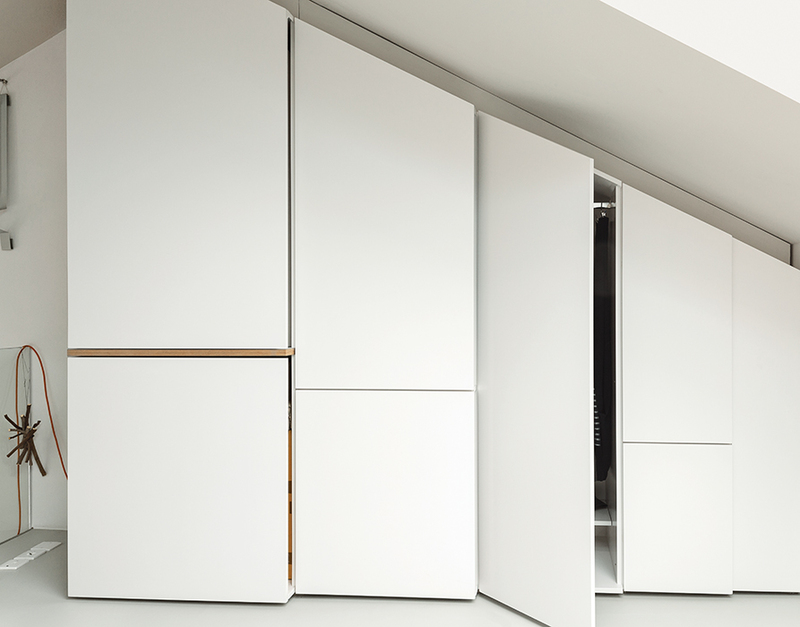 Key to this flexible subdivision of space is a sliding storage wall that Hynam and his team designed and built between the kitchen and living room; it has three sections that can be moved to either side to open up or completely separate the rooms. When friends or family stay over, ten Hompel can grab a camping mattress from the cabinets under the stairs—another of Hynam’s innovations—and close the wall to transform the kitchen into a bedroom. And when guests gather around a new dining table that seats up to nine, she can slide the wall to the side to create one big space. “Our approach was to make things that are part of the fabric of the flat, but also multifunctional,” Ullmayer says. “Rather than dictate how the space has to be used, they offer invitations of how it can be to live in. (Her heating bills have been cut about in half, she says.) New soundproofing beneath the floorboards has also made it quieter. Construction started in December 2009 and was completed the following April; detailed joinery, such as the shelves in the sliding wall and the wardrobe in ten Hompel’s bedroom, was added in phases over the rest of 2010. “I’m a slow person, so I needed to live in the space before I could know exactly what I wanted from the storage,” she says. Ullmayer Sylvester aptly named the project Living Workshop because it gives ten Hompel space to prepare models at home for the metal spoons, bowls, and other objects that she creates. She stores model-making materials beneath the stairs and in her bedroom, cuts them into shapes on her kitchen island, and puts them together on the clean sweep of floor in her living space, where she also cuts firewood in the wintertime, “like a hunter-gatherer in London,” she says.